Ok so I don't yet know how to do these blogs very well, but we will just keeping working on it. 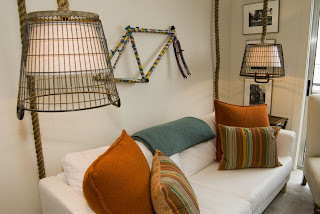 This is her living room with two basket hanging fixtures. These were done with a swag since we didn't want to hardwire in an apt. The coffee table is an old train depot cart that was rotting in my husband's warehouse. The orange rolling cart is great with old paint on the top. The couch is from Ikea (about $500). 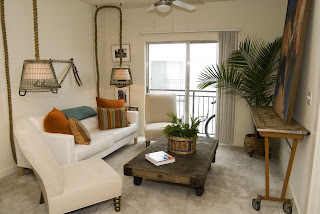 The pillows add alot of color to the room. 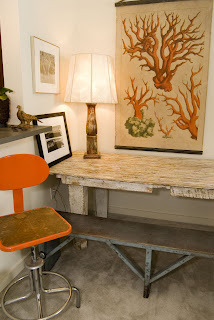 She didn't really need a "dining room table" so we use it as a work space with a bench instead of chairs. The bar stools are old chemistry class stools. The lamp was found at a garage sale and has a skin shade. The wall hanging ties all the colors together. I also love using black and white photography. I think it is wonderful as art whether taken by you, your friends or someone great. Just frame it all alike and it will create it's own design. These chairs have a flair of their own. They use to be slipper chairs which were kind of boring. So I recovered them in a linen fabric but used old coffee bean bags for the back of them. I love that they don't match from the back but from the front they have a natural look. Also the bags are scratchy so you don't probably want to use them on the front. 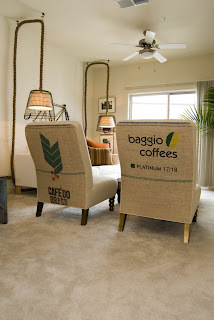 Coffee bean bags can be used for tons of things but they do not clean very well so make sure it is not something that you are going to get dirty often. Her headboard is an old fence. I love the texture of the wood. I used old shutters to frame the windows and the chests are old metal chests. 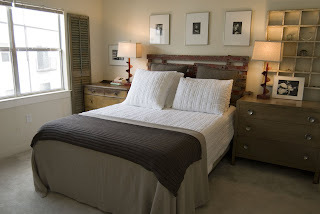 The black and white photography shows up again above the bed and leaning on the chests. Her lamps are made from old drills and the red just screamed to be in the room with that fence!! My good friend Lindy makes these fabulous lamps. Okay, this has been my longest post to date and I am worn out. Hope you enjoy!